© 2017 Yazici et al.. This study investigates the antipsychotic use patterns of patients with schizophrenia and its correlations in their daily drug use patterns. Patients with schizophrenia who have regular records at two different community counselling centres (CCS) were included in the study. Information about their medications and sociodemographic data was recorded through face-to-face interviews and supporting information about their drug use patterns was obtained from their relatives/caregivers/nurse. The Clinical Global Impression Scale (severity of illness) and the General Assessment of Functionality scales were also administered. Patients with schizophrenia used 2.0 ± 0.81 antipsychotics daily and 3.52 ± 2.55 pills (1–18). Seventy-one percent of the patients used two or more kinds of psychotropic drugs. The most frequently used antipsychotics were quetiapine, a second generation antipsychotic, and haloperidol, a typical antipsychotic. Clinical severity, regular visits to a CCS and use of depot antipsychotics were independent predictors for polypharmacy. The rate of polypharmacy use is high in Turkey. There are multiple risk factors related with polipharmacy. New studies should focus risk factors for preventing polypharmacy. Both the type and the number of antipsychotics are increasing daily and new indications for antipsychotics are being added to the existing ones in updated guidelines. The treatment or/and the pharmacotherapy for schizophrenia are a dynamic process that can change over time. Although typical antipsychotics were widely used after the 1950s, second generation antipsychotics are currently common  The definition of polypharmacy varies according to the different authors and disciplines. In psychiatry, the use of two or more kinds of antipsychotics is defined as antipsychotic polypharmacy , while, in general, the use of two or more psychotropic drugs is defined as psychotropic polypharmacy . Although, in clinical practice applications, there are several guidelines for the use of antipsychotics for schizophrenia, this varies in the real world. For example, antipsychotic polypharmacy (APP) is widely used in clinical practice. Despite the lack of robust evidence, the increased risk of side effects and the cost implications for this approach, APP is commonly used in schizophrenia. APP prevalence rates vary widely, from 4–92.2%, depending on study design, patient population, diagnosis and geographical region [4-6]. In previous studies conducted in Asia, the polypharmacy rates were similar or higher than Turkey results. A multicentre study conducted on schizophrenia patients in East Asia reported antipsychotic polypharmacy rates to be 45.7% . Earleir studies in Asia reported antipsychotic polypharmacy rates of 90% in Japan  and 59% in Singapore . On the other hand, in Europe, the rates were reported to be 43.9% in Germany , and in Spain, there was a 13.9% antipsychotic combination and 19.4% unspecified combinations . A recently published retrospective cohort study (with 4,156 patients included in the study) in the United States reported that antipsychotic polypharmacy in patients with schizophrenia was 23.3% . The polypharmacy rate in a Norwegian study of schizophrenic patients’ antipsychotics when they were discharged from an emergency ward was recorded and the polypharmacy rates were observed to be 35.6% and 24.9% when low potency first generation antipsychotics(FGAs) in doses below a 100 mg/day chlorpromazine (CPZ) equivalent dose were excluded . In a one study in Nigeria polypharmacy psychotropic agents were reported as 92% for general psychiatric outpatients and 94% in schizophrenia patients . It is well established that polypharmacy has harmful effects. It is not recommended and all psychiatrists undoubtedly know this information. Nonetheless, polypharmacy continues to exist in the real world and its use increases each year. Therefore, the question is ‘What is the reason for polypharmacy?’ There are several studies about the predictors of polypharmacy: the common associated factors are male gender, younger age and being single and unemployed. Other factors are primarily related to clinical severity and poor functionality of the patients, such as having severe psychopathology, residual psychotic symptoms, poor cognitive function, poor insight into the illness, additional psychiatric co-morbidity, in-patients of a psychiatric hospital, involuntary admission, more frequent admissions and the use of depot antipsychotics . Polypharmacy continues to exist with increasing frequency and there is no clear answer regarding what to do about solving this problem. Consequently, there is still a need for updated natural/realistic data to understand the correlates as well as the severity of the condition. This study investigates the antipsychotic use patterns of patients with schizophrenia and its correlations in their daily drug use patterns. This study was conducted in 2015 with 280 patients with schizophrenia whose treatment and rehabilitation programmes were provided by the Sakarya Community Counselling Centre (Sakarya TRSM) and the Derince Community Counselling Centre (Derince TRSM). Ethical approval was obtained from the Sakarya University Medical Sciences Ethical Committee. Written consent was obtained from all of the participants of the study. The community counselling centres (CCS) in Turkey monitor patients with severe mental illness with schizophrenia, schizoaffective disorder or bipolar disorder as a primary diagnosis. Most of the patients are clinically stable outpatients and, in general, they come to the centre either daily, weekly and sometimes irregularly or they are visited in their home by the centre; this differs according to the patients’ clinical need, level of social support, environmental/economic status, etc. At the time when the study was conducted, Sakarya TRSM had 503 recorded patients with severe mental disease and Derince TRSM had 355 patients. Records from previous six months were evaluated and patients were filtered in two stages. First, the ones with schizoaffective and bipolar disorders, the ones with comorbid substance-alcohol use disorders and the ones with organic disorders of the central nervous system, such as epilepsy, multiple sclerosis, etc., were excluded. Patients who had inconsistent or missing data were excluded. Patients with schizophrenia who used at least one type of antipsychotic were selected for the study. Patients whose data in the records was accurate, complete and available to be checked with the caregiver or nurse were asked to participate; only voluntary patients over age 18 were included in the study. Second, the chief psychiatrists of both centres (SB and SB) checked the accuracy of the diagnosis of schizophrenia; the study was conducted on patients with schizophrenia according to DSM-V criteria. Patients who had been diagnosed with schizophrenia for at least one year and who had not been hospitalized during the last six months were accepted. Information regarding their medications and sociodemographic data was recorded through a face-to-face interview; supporting information regarding their drug use patterns was obtained from their relatives/caregivers/nurse. The Clinical Global Impression Scale (severity of illness) and the General Assessment of Functionality scales were also administered. The classification of antipsychotics as first generation and second generation was conducted according to Psychotropic Drug Directory  Doses of the antipsychotic were calculated as a chlorpromazine equivalent (CPZeq), according to a previous study conducted by Kroken et al. , which is reviewed and abstracted previous literature on a table of equivalents doses. It is known that sometimes the equivalent dosages under chlorpromazine 100 mg may not have the exact intention of their antipsychotic effects . So two separate calculations were conducted for the antipsychotic polypharmacy: The first calculation included all of the antipsychotics in all dosages and in the second calculation included only the antipsychotics that were at higher dosages of chlorpromazine 100 mg equivalent dose. Plasma levels of antipsychotics including clozapine are not used in routine treatment follow-up procedure in CCS so plasma levels of drugs were not available in this study. Sociodemografical and Clinical Data Form: This a form prepared to include sociodemografic and clinic data about the patients as the gender, age, education, marital status, occupation, family history, etc., and questions about the duration of illness, number of hospitalisations, suicide attempts, violence and treatment adherence. Clinical Global Impression Scale (for Severity) (CGI-S): This scale is used to assess the severity, the improvement rate and the medication side effects of psychiatric disorders. The illness severity subscale was used in this study. The scale for the severity of illness refers to the clinician’s global impression of the patient; it is scored between 1 and 7. The scale scores rise as the severity of the illness increases . General Assessment of Functionality (GAF): The GAF scale, which is structured in accordance with the DSM-IV, assesses the patient’s psychological, social and occupational functioning. The general framework of this scale uses a single measurement to help monitor clinical progress of an individual. It involves general rating of a person’s functioning at that moment or in the past and is done by a clinician who gives points between 1 and 100 . Statistical Analysis: The data were analysed using the Statistical Package for the Social Sciences 17.0 (SPSS Inc., Chicago, IL, US). To compare the mean values of the linear variables, the Student’s t-test was used for the groups with a standard distribution and the Mann–Whitney U-test for those that did not have a standard distribution . The chi-square test was used to compare categorical variables . The Pearson’s correlation analysis was used for correlation analyses and the linear regression analysis for identifying the predictors . Finally, 149 schizophrenia patients from Sakarya TRSM and 131 from Derince TRSM (total 280 patients) who had regular records at the respective community counselling centres over the previous six months were included in the study. The mean age of the patients was 40.9 ± 9.9 (19–70) and 66.3% of the patients were male. The sociodemographic and clinical properties of the patients are provided in (Table 1). Table 1. Sociodemographic and clinical properties of the patients. The patients were evaluated according to the kinds of psychotropic medications and the pills that they used daily. The patients with schizophrenia used 2.0 ± 0.81 antipsychotics daily and 2.61 ± 1.07 psychotropic drugs (0–7). They used 3.52 ± 2.55 pills per day (1–18). Their rate of using two or more kinds of psychotropic drugs was 70.71%. The number of daily pills was 2.64 ± 2.61 for patients with monotherapy and 3.89 ± 2.46 for patients with polypharmacy (p < 0.05). The number of different kinds of antipsychotic use is given in (Table 2 and Fig. 1). Table 2. Number of antipsychotics used. The overall rate for the use of at least one second generation antipsychotic in all of the schizophrenic patients was 96.9% and the rate for the use of at least one typical antipsychotic was 17.2%. The rate of use of long-term antipsychotics (depot) was 56.8%. When equivalent dosages of antipsychotics lower than 100 mg of chlorpromazine were excluded, the polypharmacy rate decreased to 63.4%, the use of two kinds of antipsychotics was 40.9%, three kinds was 21.5% and the rate for four antipsychotics was 1.1%. The most frequently used second generation antipsychotic was quetiapine, with a rate of 35.5%, and the most frequently used typical antipsychotic was haloperidol, with a rate of 2.5%. The distribution of the rates of antipsychotics is provided in (Fig. 2). Fig. (1). Antipsychotic use patterns of patients with schizophrenia. Fig. (2). Oral forms of antipsychotics actively used by schizophrenia patients. Either anticholinergic drugs or biperiden was used by 22.9% of the patients and 11.8% of the schizophrenia patients used antidepressants. Other drugs such as benzodiazepines were used at a rate of 11.4%. Using monotherapy or polypharmacy did not have a relationship with the patient’s age, gender, education, marital or occupational status. In addition, it was not related to the number of hospitalizations, the total duration of the hospital stays, having a suicidal attempt or having physical violence (all p > 0.05). Having a psychotic patient among the patient’s relatives was related to polypharmacy; the patients who had a psychotic patient relative had higher rates of monotherapy than the ones who did not have a psychotic patient relative (monotherapy rate 39.4% vs 25.8%, respectively). A daily or weekly visit with the CCS was also related with polypharmacy. The patients who regularly visited the CCS had higher polypharmacy rates than the ones who did not (polypharmacy rate 75.5% vs 64.8%, respectively). Patients with higher polypharmacy rates had a significantly higher severity of disease according to CGI-S and lower functionality according to GAF (Table 3). Table 3. Clinical severity and functionality of the patient and polypharmacy. 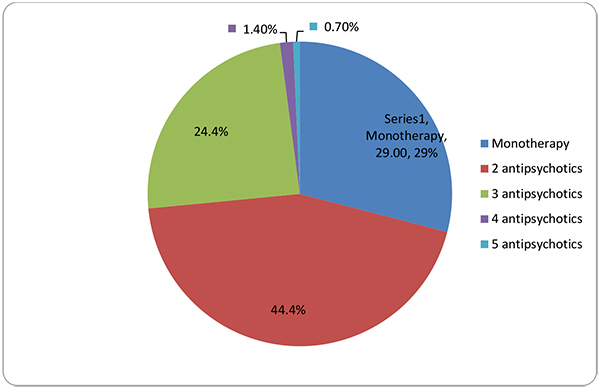 The question ‘Is there nonadherence to medication during the last month?’ was answered as yes by 18.5% of the monotherapy group and 24.2% of polypharmacy group. The difference was not statistically significant (p > 0.05). Use of clozapine and other antipsychotics: There was no significant relationship between the use or dosage of clozapine and polypharmacy (p > 0.05 in X2 for use and independent t-tests for dose). With the exception of quetiapine, there was no difference between the use and dose of other antipsychotics or polypharmacy. For quetiapine, the mean dose was 105.00 ± 71.58 for monotherapy patients and 390.69 ± 261.97 for polypharmacy patients; patients who used polypharmacy also used significantly higher doses of quetiapine (p < 0.05). Use of depot antipsychotics: In the polypharmacy group, the use of depot antipsychotics was 68.68% and in the monotherapy group, it was 18.86%. The polypharmacy group used depot antipsychotics in significantly higher rates (p < 0.05). A regression model consisting of the associated factors was found by our results to determine the independent predictors of polypharmacy. Using a depot antipsychotic, having regular visits to the CCS (daily or weekly), clinical severity, level of functionality, having a psychotic relative, and gender (due to data at previous studies) were selected as predictors and polypharmacy was selected as the independent variable. In this model, using a depot antipsychotic, having regular visits to the CCS (daily or weekly) and clinical severity were significant (adjusted R2: 0.189; p < 0.05) predictors for polypharmacy. The mean dosages of antipsychotics were compared between monotherapy and the polypharmacy groups. The mean dosages and the final total chlorpromazine equivalent doses are given in (Tables 4 and 5). Table 4. 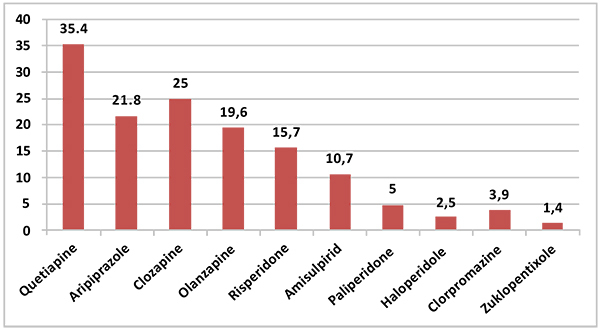 Mean daily dosages of chlorpromazine equivalent doses. Table 5. Comparison of mean daily dose of antipsychotics between polypharmacy and monotherapy groups. This study was conducted with clinically stable schizophrenia patients who showed high rates of antipsychotic polypharmacy, at a rate of almost 71%. When the kinds of antipsychotics are corrected according to lower dosages of the CPZ-equ 100 mg, the polypharmacy (antipsychotic combination) rate was 63.2%. High rates in Turkey may be related to many reasons. Refractory schzophrenia is shown to be related to high rates of polipharmacy and high rates of clozapine use. . Our sample mostly consisted of patients who did not have enough functionality to have their own occupation and sought rehabilitation service from community counseling centers. So the probable high rates of refractory schzophrenia may be a reason. In search for other reasoning behind polypharmacy, we considered the geographic-cultural position of the country too. In previous studies, a relationship was found between ethnicity and polypharmacy. This may be due to genetic influences on response to treatments, symptom profile of schzophrenia and all other probable related pharmacogenetics [27, 28]. Turkey is a localisation country between Asia and Europe and it has various ethnic combinations. The polypharmacy rate seems higher in this study than in the European and American studies and may be accepted as either similar with/or a bit lower than that of the Asian and other countries. The ethnic, genetic, environmental and cultural components may have roles in the formation of antipsychotic prescriptions. In a previous study conducted in Turkey, the rate for the use of two or more antipsychotics was 40% . In another study conducted by Özalmete et al.. (2003), the polypharmacy rate reported in hospitalized schizophrenic patients was 48.89% . In 2010, a Turkish study reported the polypharmacy rate in inpatients as 72.1%; here, the psychosis group had the highest polypharmacy use among inpatients . A study in 2015 reported polypharmacy rates of 62% for schizophrenia patients . Although there are methodological differences between the studies, our study is very similar to that one, which was conducted in the same country in the same year. On examining this literature, it appears that the rate of polypharmacy is increasing slightly in Turkey. Since this is a similar condition to that of other countries such as United Kingdom and South Korea, the tendency to polypharmacy has been increasing recently [33-36]. Decrease in polypharmacy has been reported in Japan. Although there are methodological diffrences between studies, importance of health policies for decreasing polipharmacy is underlined in the study and we think on smilar pattern with that . The increase in polypharmacy rates is a dynamic process so it needs explanation more dynamic than etnicity and refractory schizophrenia. For example, changes in health policies may be related to changes in the rates of polypahrmacy as in Japan. Because we questioned whether the higher numbers belonged exclusively to the type of drugs or if the dosages were also higher, we evaluated chlorpromazine equivalent dosages of the daily antipsychotic medications. According to our study, the mean CPZeq dose in the patients was 684 mg. A Norwegian study reported the CPZeq dose at discharge as 450 mg (SD 347, range 25–2800). Another study conducted with acute schizophrenia patients reported a CPZeq dose of 942.1 mg (SD 805.6) . In an East Asian study, the polypharmacy group had a higher CPZeq mean dose than the monotherapy group (983.10 vs 411.47) . These results are similar to those of our study (834.32 vs 328.55). Shifting to another antipsychotic by slow titration is a typical reason for polypharmacy . However, in our study, patients with an antipsychotic combination used almost three fold higher dosages of antipsychotics than the monotherapy users. This suggests that they are combination of high doses of antipsychotics and these particular cases are not in a titration period. On the other hand, the mean dosage in polypharmacy is 831.32 mg, which is still just between the ranges of the effective dosage for chlorpromazine, albeit very near the upper limit . This result suggests that practitioners do not prefer using one type of medicine in a maximum dosage but instead preferring to use the optimal dosage and another one if needed. When they were calculated individually, except for quetiapine, there was no significant difference between the dosages of antipsychotics in the polypharmacy and monotherapy groups. This means that the same dosage of antipsychotics was used in the polypharmacy group and another one was added in the same dosage to the first one. This result also suggests a combination of optimal dosages of antipsychotics instead of the minimal dosages. This condition suggests a need for higher dosages of antipsychotics as a referee to clinical severity. The rates and dosages of clozapine were similar in both groups. Only quetiapine was higher in the polypharmacy groups, suggesting the need for higher dosages in the polypharmacy group. This need may be related to the clinical severity of the illness. In previous studies, the clinical severity of the patients has been shown to be the greatest potential predictor parameter for polypharmacy . In this study, clinical severity was related to polypharmacy as an independent predictor; clinically more severe and low functional patients used antipsychotic combinations instead of monotherapy. The use of depot antipsychotics was more frequent in the polypharmacy group of this study, confirming the previous results [6, 41, 42]. The use of depot antipsychotics was also an independent predictor for polypharmacy in this study. Depot antipsychotics are generally preferred in patients who are not expected to adhere strictly to their treatment. Lack of insight and poor cognitive function are central to poor treatment adherence in schizophrenia . Perhaps it is speculative, since low-treatment adherence has been reported in previous studies, but we anticipated that the use of depot antipsychotics might refer to a clinically difficult situation to manage . So, depot antipsychotics may be the reason of polypharmacy but a special group of patients with low adherence to treatment or treatment resistance may be reasons for both the need of depot antypsyhotics and polypharmacy. Therefore, polypharmacy may be sometimes considered in association with a clinical need. Polypharmacy results in an increased number of daily pills. In this study, the mean daily pill count was 3.52 and it increased up to 18 pills daily. Although the polypharmacy group in this study used a significantly higher number of daily pills, there was no significant difference between the monotherapy and the polypharmacy group. This result was congruent with a previous study that showed that treatment adherence was not directly related to the number of medications but adverse effects increase with polypharmacy in patients with schizophrenia . In this study, there was a relationship between monotherapy and having a relative with schizophrenia. This may have multiple explanations. Knowing the disease may help a better experienced patient care and strict follow up of medicines and this may help decrease polypharmacy with a better response to treatment on monothraphy. But knowing the disease may be related also to having realistic expectations about remission, in this situation, a lower degree of enforcement for a better clinical condition may result in monotherapy. Probably the patients, who have been seen In congruence with this hypothesis (high expectations: more drugs), 'visiting a community counselling centre regularly' had higher polypharmacy rates; furthermore, it was an independent predictor in regression analysis. We considered that the CCS team realized the symptoms of the patients by regular/frequent visits and this caused higher degrees of enforcement to remission of symptoms; therefore, more drugs were used for a better clinical condition. This data is interesting because we think it has a reference to symptoms focused treatment of schizophrenia. Kind and dosage of medication are managed according to the symptoms. Probably the patients, who have been seen more frequently by the doctor, had more opportunity to tell about their symptoms or the symptoms were observed by the medical team more than others, and the medical team needed to treat these symptoms with more medications than usual (others). Probably, we need to discuss the appropriate approach while managing the treatment of schizophrenia, as a cluster of symptoms or as an integrative syndrome includes daily, social, cognitive functionality, symptoms and treatment adherence, adverse effects etc. This study showed that the second generation of antipsychotics was most widely used in schizophrenia outpatients and the most commonly used agent was quetiapine. According to another previous study conducted with outpatients in Turkey, the most common antipsychotic use was depot neuroleptics 46.7%, risperidone 45.0% and olanzapine 45.0% . A recently conducted study in the US reported that risperidone was the most frequently used antipsychotic agent and the most frequent combination polypharmacy included FGA, olanzapine and risperidone. The most preferred antipsychotic combination was quetiapine plus risperidone . In Germany, it was olanzapine  and in Korea, it was risperidone and haloperidol but the monotherapy group was olanzapine. In the UK (2007–2011), the primary care setting most commonly prescribed first- and second-generation antipsychotics: olanzapine, risperidone and chlorpromazine, respectively . In Spain, olanzapine and risperidone were reported . However, quetiapine is the most prescribed antipsychotic for off-label use in general mental disorders by psychiatrists in New Zealand and physicians in the US [47, 48]. Although quetiapine was the most commonly prescribed antipsychotic by psychiatrists for schizophrenia in our study, almost all of it was used in the polypharmacy group. It appears that it is prescribed as an antipsychotic agent and for other symptoms such as depression, insomnia, anxiety, etc. This study investigated the current status of antipsychotic use patterns of outpatients with schizophrenia. Although the small sample size is a limitation of the study, it presents data from two large cities in Turkey. Adverse effects of antipsychotics, clozapine plazma level, symptom and functional outcome of the patients were not assessed as other limitations. The strengths of the study are that experienced psychiatrists confirmed the diagnoses of the patients and the uses of the drugs were evaluated by face-to-face interviews instead of retrospective prescription records. This study showed that polypharmacy is used in high rates in Turkey; claiming a pattern of clinical need, second generation antipsychotics are used in very high rates and quetiapine is the most frequently used antipsychotic. The clinical severity of the patient is an important factor for polypharmacy. Regular visits to CCS were related to higher polypharmacy rates. High rates of polypharmacy require detailed explanations along with its rationale and risk factors. Studies assessing physician- health policy related factors should be conducted as well as patient related factors. Thus, creating preventative health policies may be realistic and possible. Stahl S. Essential Psychopharmacology: Neuroscientific Basis and Practical Applications. In: Stahl’ın Temel Psikofarmakolojisi Nörobilimsel ve Pratik Uygulamalar. 3rd ed. İstanbul: İstanbul Tıp Kitabevi 2012. Gallego JA, Bonetti J, Zhang J, Kane JM, Correll CU. Prevalence and correlates of antipsychotic polypharmacy. A systematic review and meta-regression of global and regional trends from the 1970s to 2009 schizophrenia research 2009; 138(1): 18-28. Adeponle AB, Obembe AO, Adeyemi SO, Suleiman GT. Polypharmacy in psychiatric out-patient practice in northern Nigeria. Afr J Psychiatry (Johannesbg) 2007; 10(4): 215-8. Correll CU, Rummel-Kluge C, Corves C, Kane JM, Leucht S. Antipsychotic combinations vs monotherapy in schizophrenia: a meta-analysis of randomized controlled trials. Schizophr Bull 2009; 35(2): 443-57. Fleischhacker WW, Uchida H. Critical review of antipsychotic polypharmacy in the treatment of schizophrenia. Int J Neuropsychopharmacol 2014; 17(7): 1083-93. Sim K, Su A, Fujii S, et al. Antipsychotic polypharmacy in patients with schizophrenia: a multicentre comparative study in East Asia. Br J Clin Pharmacol 2004; 58(2): 178-83. Ito C, Kubota Y, Sato M. A prospective survey on drug choice for prescriptions for admitted patients with schizophrenia. Psychiatry Clin Neurosci 1999; 53(Suppl. ): S35-40. Chong SA, Sachdev P, Mahendran R, Chua HC. Neuroleptic and anticholinergic drug use in Chinese patients with schizophrenia resident in a state psychiatric hospital in Singapore. Aust N Z J Psychiatry 2000; 34(6): 988-91. Schmidt-Kraepelin C, Puschner B, Loos S, Janssen B. Antipsychotic polypharmacy in high-utilising patients with schizophrenia. Psychiatr Prax 2013; 40(7): 380-4. Antipsychotische Polypharmazie bei Patienten mit Schizophrenie und hoher Versorgungsinanspruchnahme. ger. Bernardo M, Coma A, Ibáñez C, Zara C, Bari JM, Serrano-Blanco A. Antipsychotic polypharmacy in a regional health service: a population-based study. BMC Psychiatry 2012; 12: 42. Fisher MD, Reilly K, Isenberg K, Villa KF. Antipsychotic patterns of use in patients with schizophrenia: polypharmacy versus monotherapy. BMC Psychiatry 2014; 14: 341. [eng.]. Kroken RA, Johnsen E, Ruud T, Wentzel-Larsen T, Jørgensen HA. Treatment of schizophrenia with antipsychotics in norwegian emergency wards, a cross-sectional national study. BMC Psychiatry 2009; 9: 24. Suzuki T, Uchida H, Tanaka KF, et al. Revising polypharmacy to a single antipsychotic regimen for patients with chronic schizophrenia. Int J Neuropsychopharmacol 2004; 7(2): 133-42. [eng.]. Procyshyn RM, Honer WG, Wu TK, et al. Persistent antipsychotic polypharmacy and excessive dosing in the community psychiatric treatment setting: a review of medication profiles in 435 Canadian outpatients. J Clin Psychiatry 2010; 71(5): 566-73. [eng.]. Sakurai H, Bies RR, Stroup ST, et al. Dopamine D2 receptor occupancy and cognition in schizophrenia: analysis of the CATIE data. Schizophr Bull 2013; 39(3): 564-74. [eng.]. Karamatskos E, Mulert C, Lambert M, Naber D. Subjective Well-being of Patients with Schizophrenia as a Target of Drug Treatment. Current Pharmaceutical Biotechnology 2012; 13(8): 1490-9. Wunderink L, Nieboer RM, Wiersma D, Sytema S, Nienhuis FJ. Recovery in remitted first-episode psychosis at 7 years of follow-up of an early dose reduction/discontinuation or maintenance treatment strategy: long-term follow-up of a 2-year randomized clinical trial. JAMA Psychiatry 2013; 70(9): 913-20. [eng.]. Bazire S. Psychotropic Drug Directory 2005: The Professionals’ Pocket Handbook and Aide Memoire. Salisbury: Fivepin Publishing Ltd 2005. Guy W. Clinical Global Impression, ECDEU assessment manual for psychopharmacology Rockville. Md. : U.S. Dept. of Health, Education, and Welfare, Public Health Service, Alcohol, Drug Abuse, and Mental Health Administration, National Institute of Mental Health, Psychopharmacology Research Branch, Division of Extramural Research Programs 1976. Birliği Amerikan Psikiyatri. Diagnostic and Statistical Manual of Mental Disorders -American Psychiatric Association:1994 1994. Zimmerman DW. Comparative power of student T test and mann-whitney U test for unequal sample sizes and variances. The Journal of Experimental Education 1987; 55(3): 171-4. Pace L. Chi-Square Tests Beginning R: An Introduction to Statistical Programming. Berkeley, CA: Apress 2012; pp. 217-28. Kemp F. Applied multiple regression/correlation analysis for the behavioral sciences. Statistician 2003; 52(4): 691. Correll CU, Gallego JA. Antipsychotic polypharmacy: a comprehensive evaluation of relevant correlates of a long-standing clinical practice. Psychiatr Clin North Am 2012; 35(3): 661-81. [eng.]. Barnes TR, Paton C. Antipsychotic polypharmacy in schizophrenia: benefits and risks. CNS Drugs 2011; 25(5): 383-99. [eng.]. Teo C, Borlido C, Kennedy JL, De Luca V. The role of ethnicity in treatment refractory schizophrenia. Compr Psychiatry 2013; 54(2): 167-72. [eng.]. Lim LM, McStea M, Chung WW, et al. Prevalence, risk factors and health outcomes associated with polypharmacy among urban community-dwelling older adults in multi-ethnic Malaysia. PLoS One 2017; 12(3): e0173466. [eng.]. Yildiz M, Cerit C. Antipsychotic drug use pattern for patients with schizophrenia in an outpatient clinic in Turkey: A retrospective study. Int J Psychiatry Clin Pract 2004; 8(1): 41-5. [eng.]. Ozalmete OA, Ceylan ME, Ozalmete O, Sevim ME. Antipsychotic polypharmacy in schizophrenic inpatients/Yatan sizofreni hastalarinda coklu antipsikotik kullanimi. Archives of Neuropsychiatry 2010; 47(1): 23-9. Yenilmez Ç, Güleç G, Büyükkinaci A, Dayi A, Turgut H, Uludag YT. Polypharmacy among inpatients of a university psychiatry clinic: A retrospective study. Dusunen Adam 2012; 25(1): 43. Ersan EE, Yildiz M. Antipsychotic Use Pattern in People with Psychotic Disorder Living in Board and Care Facilities 2015. Akisi Kumsar N, Dilbaz N. Practices of antipsychotic polypharmacy in schizophrenia: A review. Journal of Neurobehavioral Sciences 2012; 1(1): 28-37. Clark RE, Bartels SJ, Mellman TA, Peacock WJ. Recent trends in antipsychotic combination therapy of schizophrenia and schizoaffective disorder: implications for state mental health policy. Schizophr Bull 2002; 28(1): 75-84. [eng.]. Heald A, Livingston M, Yung A, De Hert MA. Prescribing in schizophrenia and psychosis: Increasing polypharmacy over time. Hum Psychopharmacol. 2017 Mar;32(2). Park HY, Ryu HN, Shim MK, Sohn HS, Kwon JW. Prescribed drugs and polypharmacy in healthcare service users in South Korea: an analysis based on National Health Insurance Claims data. Int J Clin Pharmacol Ther 2016; 54(5): 369-77. [eng.]. Kochi K, Sato I, Nishiyama C, Tanaka-Mizuno S, Doi Y, Arai M. Trends in antipsychotic prescriptions for Japanese outpatients during 2006-2012: a descriptive epidemiological study. Pharmacoepidemiol Drug Saf. 2017 Jun;26(6):642-656. Fujita J, Nishida A, Sakata M, Noda T, Ito H. Excessive dosing and polypharmacy of antipsychotics caused by pro re nata in agitated patients with schizophrenia. Psychiatry Clin Neurosci 2013; 67(5): 345-51. [eng.]. Newcomer JW, Weiden PJ, Buchanan RW. Switching antipsychotic medications to reduce adverse event burden in schizophrenia: establishing evidence-based practice. J Clin Psychiatry 2013; 74(11): 1108-20. [eng.]. Liu X, De Haan S. Chlorpromazine dose for people with schizophrenia. Cochrane Database Syst Rev 2009; (2): CD007778. [eng.]. Xiang YT, Weng YZ, Leung CM, Tang WK, Ungvari GS. Clinical and social determinants of antipsychotic polypharmacy for Chinese patients with schizophrenia. Pharmacopsychiatry 2007; 40(2): 47-52. [eng.]. Tungaraza TE, Zahid U, Venkataramaiah B. Polypharmacy and high-dose antipsychotics at the time of discharge from acute psychiatric wards. Psychiatrist 2011; 35(8): 288-92. Kisely S, Sawyer E, Robinson G, Siskind D. A systematic review and meta-analysis of the effect of depot antipsychotic frequency on compliance and outcome. Schizophr Res 2015; 166(1-3): 178-86. [eng.]. Hashimoto Y, Uno J, Miwa T, Kurihara M, Tanifuji H, Tensho M. Effects of antipsychotic polypharmacy on side-effects and concurrent use of medications in schizophrenic outpatients. Psychiatry Clin Neurosci 2012; 66(5): 405-10. [eng.]. Weinbrenner S, Assion HJ, Stargardt T, Busse R, Juckel G, Gericke CA. Drug prescription patterns in schizophrenia outpatients: analysis of data from a German health insurance fund. Pharmacopsychiatry 2009; 42(2): 66-71. [eng.]. Marston L, Nazareth I, Petersen I, Walters K, Osborn DP. Prescribing of antipsychotics in UK primary care: a cohort study. BMJ Open 2014; 4(12): e006135. [eng.]. Monasterio E, McKean A. Off-label use of atypical antipsychotic medications in Canterbury, New Zealand. N Z Med J 2011; 124(1336): 24-9. [eng.]. Donohue J, O'Malley AJ, Horvitz-Lennon M, Taub AL, Berndt E, Huskamp H. Changes in physician antipsychotic prescribing preferences, 2002–2007. Psychiatric services 2014; 65(3): 315-22.